Whether Mance is a guest artist with Irish traditional, Celtic Rock, New Age, Classical, World Music, Pop, Rock, you name it -- Mance delivers powerhouse performances that always deliver the goods. This is due to his skill in many genres of music, his impeccable sense of dynamics, and his remarkable improvisational ability. 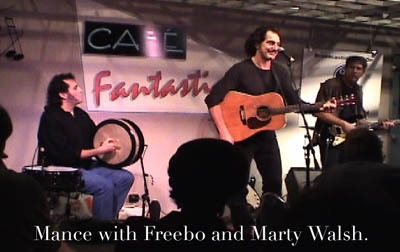 Concert with Freebo, 10 year veteran bass player with Bonnie Raitt, and Marty Walsh, of Supertramp and a whole lot more. 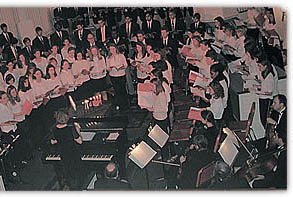 This performance was also broadcast live on radio. Mance's roots as a classically trained percussionist, plus his interests in blues, rock, big band, jazz, country, Latin, traditional Irish and more, are what make him the versatile and virtuostic player that he is today. With ethnic percussionists representing Native American, African and Middle Eastern genres & Mance representing the Irish. With the assurance and confidence that comes with a musician of Mance Grady's talent and abilitites, comes the refreshing ensemble player whose creed is "check your ego at the door and let's play for the sake of the music." While recognized mostly for his chops on the bodhrán, Mance is a tasty percussionist on drum set, hand drums and a multitude of percussive instruments. Mance Grady is regarded as a Master Player of the Bodhrán, sanctioned by the National Endowment for the Arts through RISCA's Master/Apprenticeship Program in the effort to foster the preservation and perpetuation of the art of bodhrán playing. 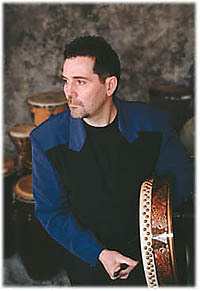 Mance is the first bodhrán player in the U.S. to receive this distinction. 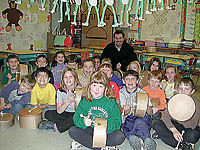 Students are offered the unique opportunity of learning from a professional who not only is regarded as one of the top players, but who is also one of the earliest bodhrán makers in North America and one of the foremost in the world. His innovative spirit continues to cross the boundaries between player and maker. Not only is he one of the early pioneers of the crossover in using the bodhrán in other musical genres, Mance can also claim responsibility for many noted improvements in bodhrán construction including his invention of the MG Slide Bar. Mance is able to offer invaluable insight on playing techniques, as well as guide his students in the proper care and maintenance of their instruments. Mance is also a member of the New England Touring Roster and the Rhode Island State Council on the Arts Artists in Folk Traditions, participating in various presentations of the Irish bodhrán in both concert and workshop settings. Previously in Concert Performances with... Liz Carroll and John Doyle, Eamon Coyne, Mick Coyne, Mac Morin, Emerald Rae, Kimberley Fraser, Patsy Whelan, Seamus Connolly, Joe Derrane, John McGann, Jerry Holland, Paddy Keenan, Tony Cuffe, Aine Minogue, Brian Conway, Felix Dolan, John Whelan, Pat Kilbride, Jerry O'Sullivan, Mick Moloney, Ally Bain, Johnny Cunningham, Triona Ni Dhomnaill, Kevin Burke, Allisdair Gilles, Eamon Flynn, Freebo, Marty Walsh, Victor Mendoza, VK Raman, and many many more. New performance and recording projects in the works. Email us to be added to our mailing list.